The Toyota Prius has been America’s premier environmentally friendly car for ten years. Now, the car has some serious competition. Both the Chevy Volt and the Nissan Leaf have an EPA fuel economy rating the equivalent of more than 90 miles to the gallon. Brad Berman is founder of plug in cars dot com. Toyota is turning the Prius into an entire brand. People going to the show will be able to see three new Prius vehicles, including a plug-in being unveiled in Detroit. 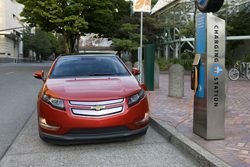 The Volt beat out the Hyundai Sonata and Nissan Leaf to take the big prize. The Volt’s a part-electric, part-hybrid car. With every automaker investing heavily in electric and hybrid technology… it makes you wonder what we’ll be driving five, 10, 50 years from now. Tracy Samilton covers the auto industry for Michigan Radio. She joins me now to talk about this. So Tracy – we’ve been hearing predictions about the death of the internal combustion engine for a decade – are those predictions coming true? Samilton: No. Based on the way batteries are going now, they’re so expensive that it is still going to be much more economical for most of us to buy a car with a regular internal combustion engine, at least for the next 10, 20 years. RW: So with all the buzz about the Chevy Volt, how many Volts does GM actually expect to sell this year? Samilton: Yeah, it’s an interesting situation because they are probably going to sell fewer cars than any other vehicle that won this award. They are probably going to sell 10,000, they are going to build 10,000 cars this year. Next year, maybe 60,000, although GM wants to sell more and is trying to figure out how can we sell more of these vehicles. RW: At the same time, Consumer Reports recently put out their latest car brand perception survey, and they found out that although most people do want better fuel efficiency, they’re not willing to pay more for it. So, how are automakers going to make these expensive electric and hybrid technologies affordable? Samilton: That’s a really good question and they’re trying to figure out the answer to that right now. It’s a chicken and egg situation. You know, they have to bring down the cost of the battery, but in order to bring down the cost of the battery, they have to get more of us to buy the car so they can bring down the price through volume. And getting a consumer to say I’m willing to pay that extra money just for the good of say, climate change, is going to be a very difficult proposition. RW: So what kind of cars do you think we’re going to be driving in the near future and longer term? Samilton: The internal combustion engine is going to be king for decades, really. For the mid-term, let’s say in the next 20 to 30 to 40 years, we’re going to see more people driving hybrids and plug-in hybrids. And really the long term is way out there in terms of when will the average person perhaps be driving an electric vehicle, maybe by the year 2050 there will be more of these vehicles on the road. And then of course, there is a good chance that we’ll start to see fuel cell vehicles using hydrogen. Very clean vehicles, but also like electric vehicles, very expensive. Tracy Samilton covers the auto industry for Michigan Radio. That’s the Environment Report. I’m Rebecca Williams.